Registration, Monitoring and Enforcement of IP rights. Cease & Desist, Demand Letters, Negotiations, Litigation & Debt Collection. Due Diligence on companies and transactions. Our Senior Business Advisor, Mike Bellamy, has been based in Asia for 20 years. The local lawyers in our network are affordable and effective. We Structure effective (and affordable!) bilingual contracts that protect our clients’ interests. Get access to a network of professional, affordable and fully licensed lawyers across Asia who provide legal support for AsiaBridge Law clients. ABL leverages scale to offer clients a lower rate than if the client was invoiced direct from the local lawyers, while providing a superior customer service experience. 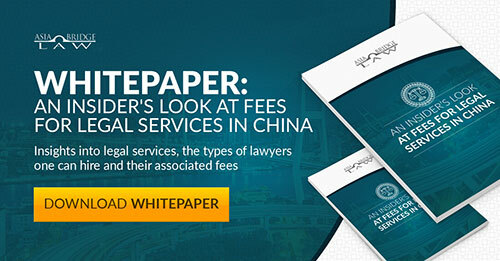 We believe clients deserve honest, professional & affordable legal services, even in Asia. Services are offered in English, Spanish, Portuguese, French, German, Italian, Russian and other major languages. Lawyers and support staff are based across Greater China, Vietnam, Thailand, Myanmar, Cambodia, Mongolia, Laos, Indonesia and Malaysia. AsiaBridge Law (ABL) maintains a network of professional, affordable and fully licensed lawyers across Asia who provide legal support for ABL clients. ABL is a service provider that engages and manages the work of lawyers in the network on behalf of ABL clients. Neither ABL nor its officers, employees or sales associates provide legal representation or legal advice directly to the client. © 2012 - 2018 by AsiaBridge Law All Rights Reserved. No part of this website may be reproduced, stored, or transmitted by any means - whether auditory, graphic, mechanical, or electronic - without written permission. Unauthorized reproduction of any part of this website is illegal and is punishable by law.